A day of annual leave booked, kids with childminder, mid week, quiet roads, lovely sunny weather – ah the perfect ride out. 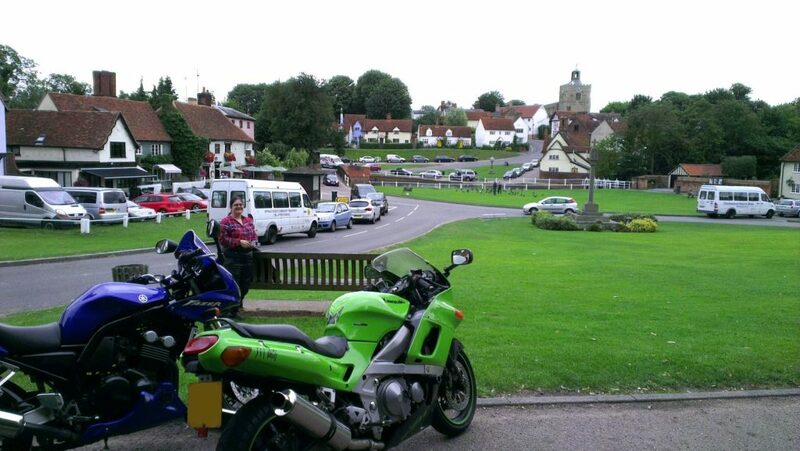 The intention for the day was to go for a reasonably long run on the bikes, get Mary more accustomed to her new ZZR400, build up her confidence after returning to biking and have a chilled out ride, culminating in a picnic in Finchingfield, Essex. The route was fairly straight forward. From Dagenham: Hainhault → Stapleford Abbots → Chipping Ongar → Leaden Roding → Great Dunmow → Finchingfield. The route is very scenic, especially the stretch North of Great Dunmow. Undulating fields, twisty bends and corn in the fields being harvested. Total length is just she of 40 miles and easily doable in under 1.5 hours. If you fancy a longer ride, you could continue North through Haverhill and onto Bury St Edmunds, which is another 28 miles. The ride went at a gently pace as Mary felt comfortable, however she quickly developed serious back issues. Always having been susceptible from her time working as a nurse and having to lug patients about. She already had a twitch of back pain prior to setting out, but it rapidly deteriorated further. Unfortunately this really marred the ride out, necessitating lots of breaks, pain killers and a slow pace. With Mary in pain and not comfortable on the ZZR, she just couldn’t get to grips with it and ride confidently. We do have a set of riser bars for the bike, which are probably worth a try. However long term, I can see us selling the ZZR on and switching to something more upright like a CB500. Backache – ah… Also a new rider, I’ve found that one needs to build up the muscles needed for prolonged riding. Driving a CB500, I’ve had just the same experience you describe here. So, I decided to back off the long rideouts and in stead gradually increase rideout length over the summer. And it has worked! By now I’m able to cover over four hundred miles in one day, stopping only when i need to buy gasoline, eat or the like.